The whole spat between Russia and the West could easily have been avoided. 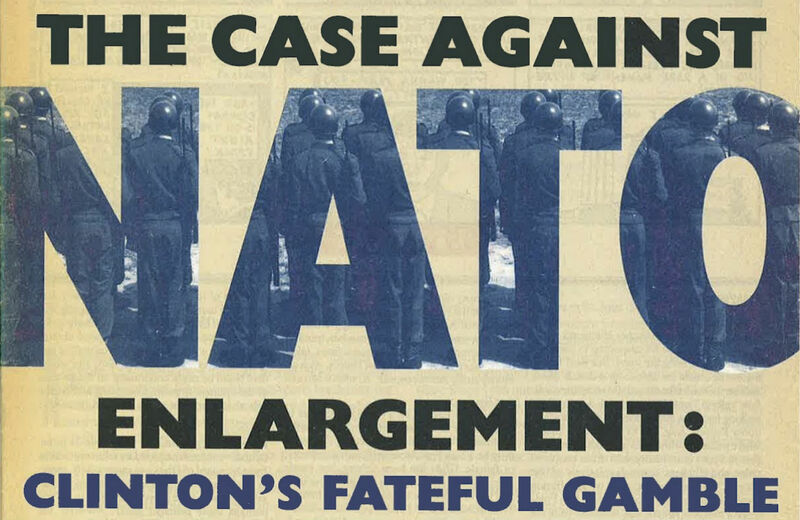 The October 20, 1997, issue of The Nation contained a ten-page cover story titled “The Case Against NATO Enlargement,” by Sherle R. Schwenninger, then of the World Policy Institute and now director of the New America Foundation’s Economic Growth Program and American Strategy Program. What is worse, NATO expansion threatens to create tensions and conflicts in the heart of Central and Eastern Europe that would otherwise not exist. For example, expansion puts back into geopolitical play most of the nations that are to be excluded from the first round of enlargement, making them again potential objects of renewed East-West rivalry. The Clinton Administration justifies NATO enlargement in part as an effort to avoid a new security vacuum in Central Europe, but even as it removes some countries from East-West competition it only increases the potential intensity of the rivalry over others, like the Baltic states and Ukraine. As NATO expands to include Poland, the Czech Republic and Hungary, the exclusion of the Baltic states from NATO membership and Ukraine from a NATO sphere of influence will become even more important goals of Russian foreign policy. The Baltic states, of course, joined NATO in 2004. I spoke with Schwenninger today about how his 1997 predictions of what the consequences of NATO expansion would be have largely come to pass. Do you feel that recent events have vindicated your essay on NATO expansion? Substantively the essay stands up well. I was a little surprised The Nation gave me so much space to be so verbose. Space is in much greater demand these days. NATO expansion negated the possibly of a real peace settlement between East and West, Russia and Europe. It prevented the sort of historical rapprochement that needed to take place, and, in consequence, introduced elements of new historical grievances and mistrust. It created additional security concerns both for Moscow and the West. It fostered uncertainty among those countries that were left out, created new divisions and endless pressures for those it excluded. That dynamic has ebbed and flowed but has constantly emerged and re-emerged over the last fifteen, sixteen years. It could have been avoided. How does Ukraine fit into the picture? Ukraine is the perfect example in the sense that NATO expansion created this new dividing line right up to the Ukrainian border. Ukraine then becomes a country that is put into play because of its position between the East and the West, rather than accepting its sort of shared destiny in the center of Central-Eastern Europe. There’s now this constant push, among the more Western nationalist forces in Ukraine, but also among their supporters in the US and Poland, for example, to extend NATO to include Ukraine. This obviously makes Russia highly sensitive to any political developments that may create a crisis affecting Ukraine’s political and economic alignment. For those forces in Ukraine who don’t want to accept the need for a political-social contract balancing out the concerns of Russian-speaking people in the east and the rest of the country, the possibility of NATO expansion emboldens them to press their case in a bid to gain NATO support. They engage in the kind of reckless aggressive actions you’ve seen members of the new Ukrainian government take, with their so-called “anti-terrorist” operations in the east. It’s an attempt to entirely dismiss the legitimate political concerns people in those regions have about the orientation of the government and the necessity of balancing Western ties with Eastern ties. It is the very dynamic I was worried about in the 1997 piece. How do your 1997 arguments against NATO expansion relate to the rise of Vladimir Putin, who seems to be getting all the blame—in the mainstream Western press—for the conflict over Ukraine? One of the observations I made in the Nation article was that after NATO expansion was announced, even Boris Yeltsin—the most pro-Western Russian leader in recent memory, in some ways a weak and, to many Russians, incompetent defender of Russian national interests—even his administration took steps to organize a counter-alliance to NATO. This notion that Putin represents an aberrant nationalist response—that response was already evident even under a much more Western-oriented or compliant Russian regime. I think Putin has been much more organized and has been probably a little more effective in re-establishing the basis of the Russian state, strengthening the Russian military, but nothing he has pronounced is fundamentally different from the initial Russia reaction: that Russia should have some sort of economic organization, some alliance to, in part, to counter NATO and to organize its interests in the former Soviet states. What should NATO leaders have learned from your 1997 article, and what could they learn today? They would have allowed NATO to have a more natural passing away and they would have strengthened the pan-European security organizations to ensure that Russia felt it had a path toward having its interests and security concerns recognized. They would have established a framework for much-needed Russian cooperation, which would be useful now, whether on Afghanistan or Iran, or dealing with ISIS and the Islamic extremist threats. The second thing is that the money that was channeled into military expansion could have been channeled into ensuring that countries like Ukraine had a jointly beneficent—for the East and the West—economic modernization program that would have built a twenty-first-century infrastructure and would have ensured you didn’t have such a sustained period of economic underperformance in the region between Russia and Poland. Instead of fueling speculation about whether NATO should expand to include Ukraine and Georgia, you would have had a neo–Marshall Plan to ensure economic development of that region and construction of a common infrastructure. More recently, we shouldn’t have been fishing in troubled waters by encouraging right-wing Ukrainians to resort to extra-parliamentary, extra–civil society actions. We should not have immediately recognized what was in a sense a street coup led by Right Sector vigilantes—not that there wasn’t also legitimate protest against Yanukovych, but if you remember, the February 21 agreement essentially called for a fairly sensible transition plan with elections, with Yanukovych to give up office. Instead we had the street coup, which the US immediately recognized, and the rump group in parliament revoking Russian as an official language. The emphasis should always have been on holding accountable those forces in Kiev, to recognize the divided nature of Ukraine, to be sensitive to the diversity of the country and the political sensibilities of those areas that would be open to Russian separatists. It should have been that the US, Europe and Russia would have immediately agreed on a program for political and economic reconstruction, rather than the US emboldening the radical elements within the new Kiev government and encouraging them to settle internal conflict by force. The US should have worked jointly with Russia for immediate conflict resolution, to go back to the February 21 agreement. Even today, instead of ratcheting up sanctions on Russia we should be welcoming the peace initiatives Putin and Poroshenko worked on at Minsk. The US and Europe should work with Russia to help rebuild the eastern part of the country, to ensure that people can return to their homes, and to secure a lasting cease-fire. Sherle Schwenninger’s 1997 essay can be read in full here.